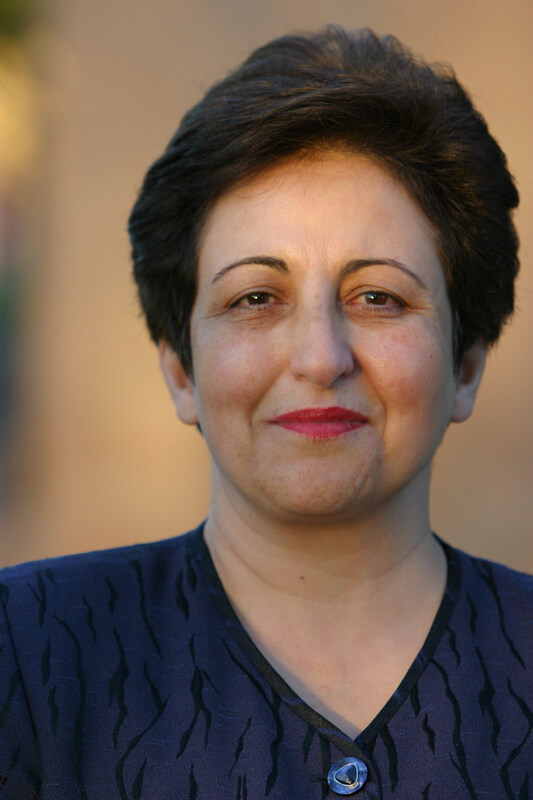 “There is a price for everything,” Iranian human-rights activist Shirin Ebadi, speaking through a translator, told the audience at First Parish Church in Harvard Square last Thursday evening. For Ebadi, the price has been extraordinarily high: she lost her career, her marriage, her fortune, and her home to her long battle against Iran’s Islamic Republic. And the battle isn’t over. Four decades ago, Ebadi was the country’s first female judge—on Bench 24 of Tehran’s city court—but after the 1979 revolution, she was dismissed and assigned instead to be a clerk in the courtroom where she once presided. That turned her into an activist, and for years she taught human-rights courses at Tehran University. When she finally secured a license to practice law in the early 1990s, she returned to the courtroom, this time as an attorney and advocate for persecuted journalists, political prisoners, women, children, and the families of murdered students and dissidents. She stayed in Iran, fighting the country’s corrupt and crumbling legal system while also communicating its atrocities to the outside world. She founded the Society for Protecting the Rights of the Child and the Defenders of Human Rights Center. In 2003 she was awarded the Nobel Peace Prize. After that, Iran’s intelligence services stepped up their surveillance and intimidation. She was arrested and threatened; the government raided and shut down her human-rights center; her home was attacked by a mob; and she watched as her law colleagues fled one by one or went to prison. Increasingly, her life was in danger. In 2009, she decided not to return home from a trip abroad, leaving behind a husband in Tehran, whom the authorities baited into an adulterous encounter and then forced to renounce her. The event, co-sponsored by Harvard’s Center for Middle Eastern Studies and Harvard Book Store, coincided with the release of Ebadi’s most recent memoir, Until We Are Free: My Fight for Human Rights in Iran. (After her talk ended, audience members clutching copies for her to sign formed a line that snaked up the far aisle and into the foyer.) Swanee Hunt, the Roosevelt lecturer in public policy at the Kennedy School, moderated, asking Ebadi about her experiences and her predictions for Iran’s future and the source of her strength. Ebadi described the prison cell where she once spent 25 days: a windowless, colorless concrete room measuring two meters by two meters, where no sound penetrated and fluorescent lights beamed down 24 hours a day. There was no bed or chair—only a dirty carpet to rest on. “After a while, one feels delusional in such a place,” Ebadi said. Some of her clients have spent whole years in cells like that. The most stirring part of the evening came toward the end, when Hunt invited listeners to the microphone to ask their own questions. Clambering out of the narrow pews, a dozen people came forward, lining up at the front of the sanctuary. The last person up to the microphone was a young man in a dark green jacket. “I have no question,” he began. “I just want to—” He paused. “May I speak in Farsi?” And then he did, in long tumbling sentences. He told Ebadi about how he had been a science student in Iran and how she had inspired him to go to law school instead; he told her how much her example had meant to him, how much it meant that she was here in front of him now. The young man paused again and thanked Ebadi, and then he asked if he could give her a hug. She smiled and stood up and opened her arms to embrace him, as the hushed audience began to applaud.